Ever had a computer that felt slow? At HiTech Handymen, we specialize in getting your computers as fast as they can be. And one of the best ways we can help is turn that aging computer with that spinning hard drive (yes, that's why we call them hard drives) into mean, lean computing machines. You see, whenever you access a program or app on the computer (for all operating systems) - the computer has to load the program information from the storage drive - that is, your permanent storage, not to be confused with "memory" or RAM - which is temporary. But when your storage drive relies on magnetic arms to retrieve bits of data from a spinning disk - this process is very slow - no matter how fast everything else in your computer is. You can have the most expensive and fastest processor and everything else but still have a "slow" computer if it has a hard drive. Which is why most commodity laptops and even computers over $1000 have them - they provide large amounts of storage on the cheap. But this large amount of storage always comes with the huge disadvantage of speed. That's where Solid-State Drives (SSDs) comes in. Even in 2018, many consumers are still unaware of this technology - in fact, all smartphones today have this particular type of hard drive (this time hard drive refers to the fact that SSDs provides the exact same function as HDDs). Can you imagine having your smartphone run on hard drives? There would always be the clicking noises, slow access to apps and you are prone to losing the data due to physical impacts. That's why your smartphone will feel faster than a more expensive big-box computer. Remember the old iPod Classics of the old days? - the largest ones with a screen have hard-drives in them - which is why you were able to store so much music and videos way back in 2006. Solid State Drives are not new technology, per se - they've been around for quite a while. But only recently has these particular type of drives become much more economical to buy for the smaller storage space that they provide. Aside from the more expensive cost (Gigabytes/Dollar) and the smaller storage space, SSDs are vastly superior to Hard Drives in almost every conceivable fashion. They are smaller (in size), making them suitable for laptops and smartphones. They are much much faster - allowing for lightning quick boot times, program load times, install times, data transfer times, are completely silent (no moving parts), use less energy and aren't as prone to data loss from physical impact. The only trade-off with SSDs, are of course the cost and the limited storage space. for about $50 in Q2 2018, you can purchase a 1TB HDD at that price. For $50 in SSDs will typically net you only 128GB of storage. But that 128GB of storage will be lightning quick and that is where you should install your OS and favorite programs to. 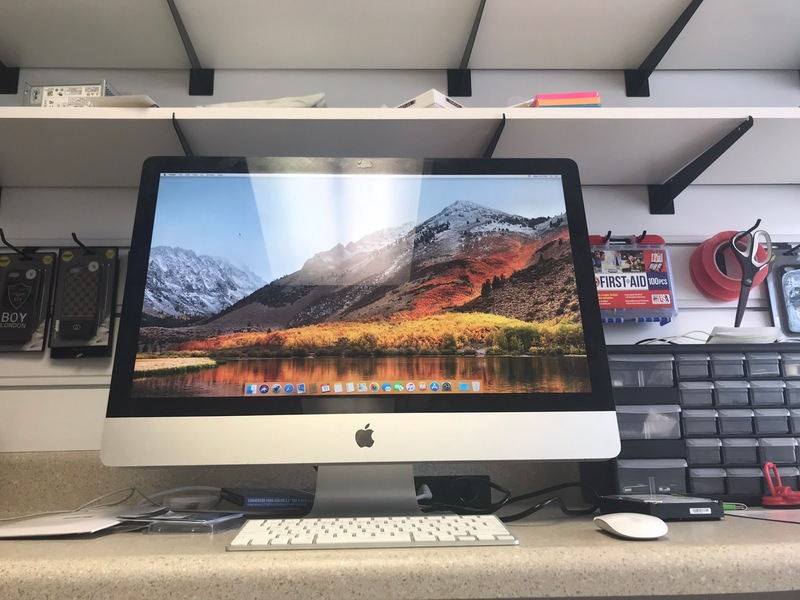 So with a brief primer on why SSDs are so good, we'd like to show you exactly how our services can help you transform your computing experience - by sharing a recent project that we did for a customer here with you all. 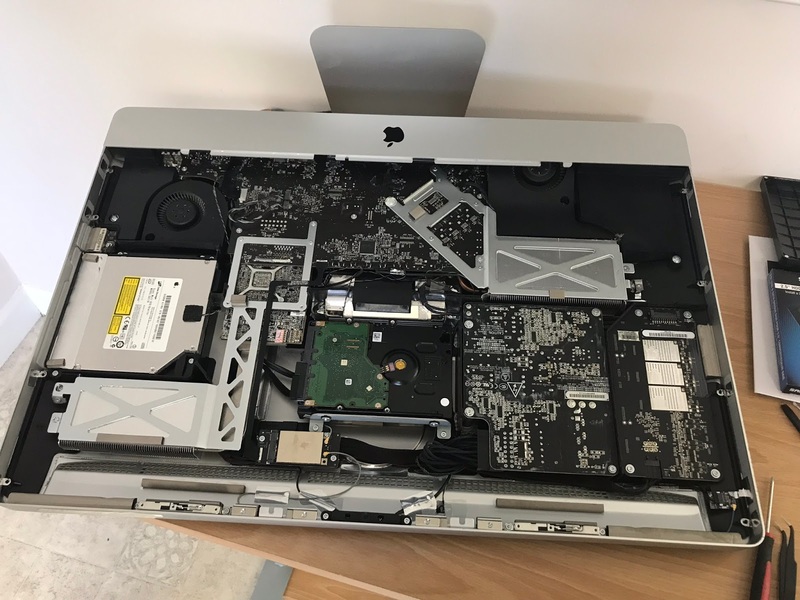 We took a customer's iMac which had problems booting up - we found out the hard drive was likely corrupted. After determining that the HDD would need to be replaced, we ordered the replacement 500GB SSD for replacement. Here are pictures demonstrating a small example on how HiTech Handymen can help accelerate consumer and business computing experience. As always, our labor warranty (excluding separate replacement drive warranty) for 120-Days so you can count on our help down the road. Enjoy our showcase of our recent customer SSD upgrade - their boot times and loading times shot through the roof after it! A quick internal shot of the iMac with the original HDD installed. Installing the speed demon in! Notice how much more compact it is! Completed install with MacOS High Sierra!